Sigma Beauty Blog: NEW Performance Eyes Kit! Eye Liner (E11) Made for precise lining of upper and lower lash lines. The E11 is best for producing detailed looks such as the classic cat eye or double-wing. Take it a step further by creating a more unique look like seen here! Tightline Liner (E16) Ideal for application of cream, gel and powder formulas on the upper lash line. Create the appearance of thick and full lashes by using the E16 to apply a dark brown or black eye shadow directly onto the lash line. Waterline Liner (E17) Perfectly applies cream, gel and powder formulas on the lower waterline. Use the E17 to apply a dark shadow to the waterline to intensify eyes, or a white shadow to brighten them. Smudge (E21) Softens harsh lines on the upper and lower lash lines. This brush is an essential tool for smudging out shadow and creating the perfect sultry smokey eye. Blending (E36) Precise blending of powder products on small areas, such as the inner corner of the eyes. The E36 works to seamlessly blend out shadows to define eyes and smooth out any jagged lines. Shader – Inner Corner (E46) Perfect for application of highlight shades in the inner corner of the eyes. Produce an eye-brightening effect by applying a highlight powder into the corner of the inner eye. For a glam look, use a golden shade instead. Shader – Crease (E47) For applying and blending darker shades onto the crease. The E47 is essential to apply and blend out shadows to create dimension and depth within the crease. Shader – Lid (E56) Precise application of pressed and loose eye shadow onto the lid. Works to create a base for an elaborate eye look. 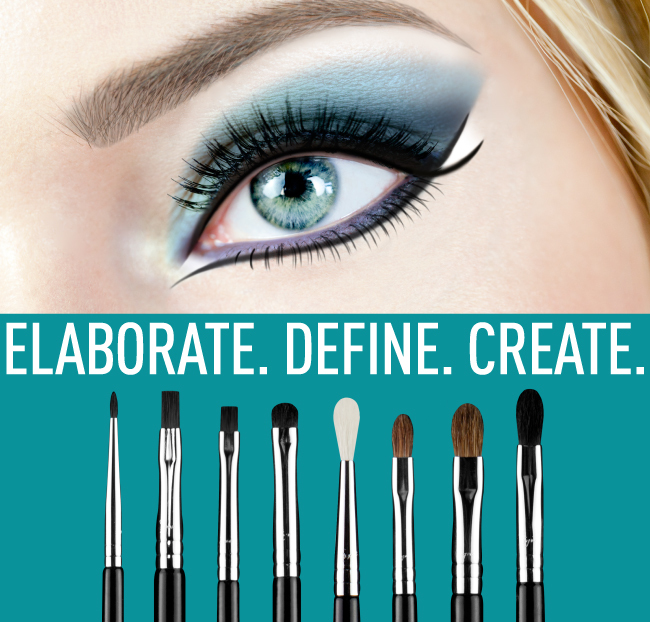 I love all the Sigma eye brushes in this kit especially E16&E21! By the way - just a few days ago I made my first order on your web-site! So looking forward for my brushes! ADOROO todos os pincéis da Sigma. Maravilhosos!!! O Duo Fiber é meu número 1. I need this kit! I am not sure I can justify it, I have so many brushes already! But you can never have too many...right? Wow este kit esta genial, queria infomaros de que sin querer he borrado mis barners sobe este kit, si me lo podeis envia nuevamente, un saludo. I love playing up my eyes.. I must purchase this lol. i have ordered a kit from here.. a month and a half agooo and it has noooo comeee! These are just the types of brushes I've been longing for. Already made a post on my blog about the kit being released! This is a must-have kit!!! estou apaixonada por estes pinceis, ja comprei , esperando chegar.. IT FOLLOWS ME, ACCORDING TO YOU! Will any of the brushes be available for individual purchase? Your company is really listening to the people.